#GAfE4Littles chats have been occurring since August of 2016! We have had a number of discussions on a variety of topics from growth mindset to HyperDocs to discussing the 4 Cs and many more! Check out the archive to previous #GAfE4Littles chats HERE! Chats are twice a month on the first and third Tuesday of each month at 5 PM PST. In a Twitter chat, a moderator asks questions throughout one hour on a specific hashtag and chat participants respond. 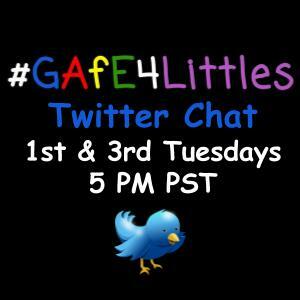 The moderator will ask questions with Q1, Q2, Q3, etc and participants will respond with A1, A2, A3, etc along with the hashtag, in this case it is #GAfE4Littles. It is encouraged that you comment or respond to participants answer responses! Twitter chats are a great way to get the collaboration juices flowing and expand your PLN (professional learning network). The thing is you don’t sign up…you virtually show up! 🙂 I like using TweetDeck when I participate in Twitter chats. 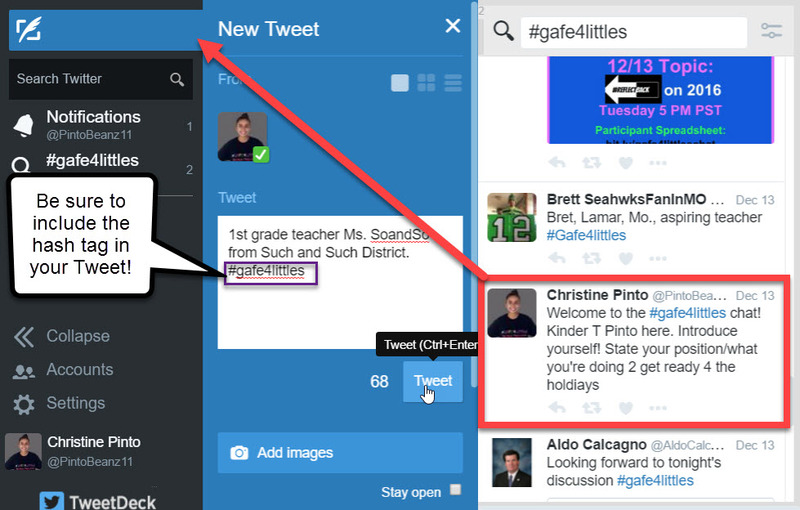 If you’re participating in the #GAfE4Littles chat, a little BEFORE 5 PM, set up your TweetDeck. Go to tweetdeck.com and sign in with your Twitter account information. TweetDeck provides suggested “columns” for you. In a resting period (NOT during a chat), you might like to have multiple columns for your viewing purposes. During the chat, the LEAST amount of columns you have the better. In the column header there is a filter icon . Click on it and select Remove, to close a column. I suggest leaving your notifications column open, so you can see who responds to your Tweets. 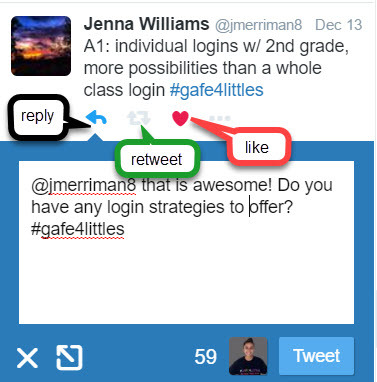 Then, you will want to add a column for the GAfE4Littles hash tag. On the left side, locate the “+” icon to add a column. Click on the magnifying glass and type in #gafe4littles in the search box and hit enter. 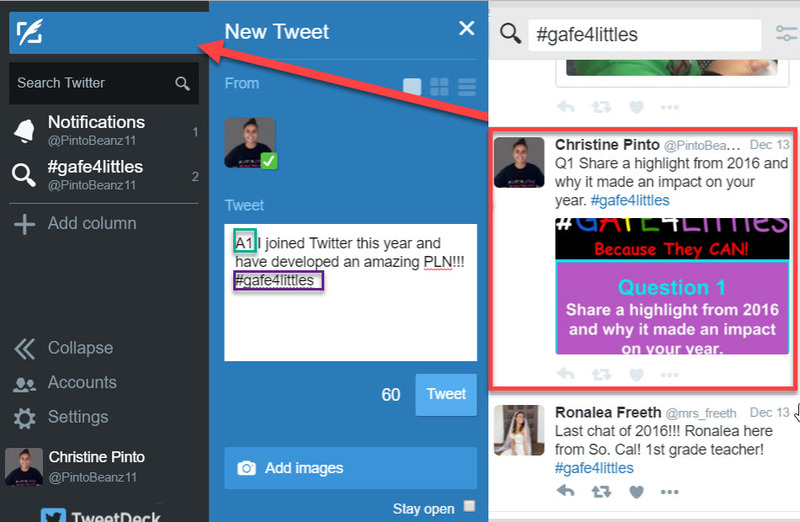 A column with content from the GAfE4Littles hashtag will appear, on the bottom you will see the option Add Column, click on it! Anyone who is participating in the chat will be using the #gafe4littles hash tag, that is how you will see the discussion. At 5:00 I post the first Tweet of the chat, usually asking for you to introduce yourself! Participants usually include their name, what grade level they teach, what district they are from or where they are located and of course #gafe4littles. When you spot my Tweet asking for your introduction, locate where it says New Tweet on the left, and write a Tweet. The pattern is similar when a question is posted. I usually post questions with an image so they are easy to spot in the feed. When you see a question posted, you can respond with A and whatever number the answer is along with your response and #gafe4littles. To respond to someone, click on the reply arrow and type a response. Be sure to still include the hash tag #GAfE4Littles. You can also “like” or “retweet” a Tweet. Retweet means that the Tweet will re-post onto your Twitter feed. Upon clicking on the above link, a copy of the spreadsheet will be made for you. All you have to do is type your responses in the yellow cells. On the day and time of the chat, you will want to have TweetDeck (or Twitter) AND this participant spreadsheet open in side by side tabs. When it comes time to Tweet out an answer, go to the spreadsheet and click where it says Click here to Tweet. A blue link will appear on top, click on that link. You will be led to another tab where the response formula (A1 and the hash tag) are automatically added. All you have to do is click on Tweet and then close the tab (CTRL and W is the shortcut to close the tab). Below is the participant spreadsheet that gets updated when there is going to be a chat. This entry was posted in Twitter by Christine Pinto. Bookmark the permalink.